The project included a new wastewater collection system and treatment facility serving the village of Sonestown. 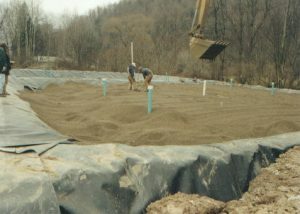 The system was needed to serve approximately 60 homes and commercial enterprises with contaminated wells and failing septic systems. one duplex submersible pump station that includes a soil odor filter. The variable grade sewer follows the natural terrain, dipping below Muncy Creek and Big Run without pump stations. This allows 80% of the pipe to be less than 5 feet deep. The entire Village is served by gravity collection. 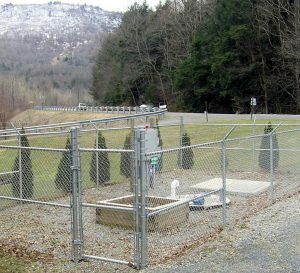 Wastewater from the lower 2/3 of town flows to a pump station at the south end of town, which conveys it to the treatment plant. 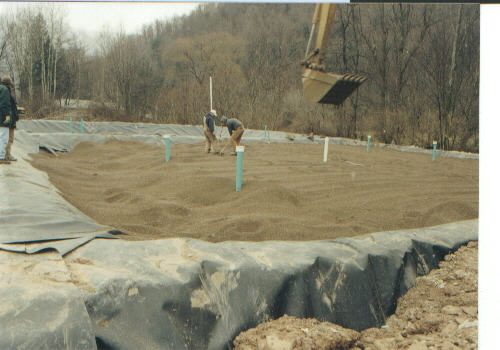 The WWTF features a 24,000-gpd recirculating sand filter. A pump station recirculates the filter effluent five times, providing tertiary treatment. A weir box apportions the filter effluent between recirculation and discharge through the chlorine tank. The plant and pump station include soil odor filters, a tablet feed chlorinator and a chlorine contact tank. The treatment facility, located next to the Township Building, has features, including an emergency generator and a potable water treatment system that allow the Township building to serve as an emergency shelter. Funding: PENNVEST grant and loan package, two CDBG grants. Project Included: Obtained approximately 50 easements, set the treatment plant was set on township property.